After eating a greek pizza at Athens Pizza for our Pizza Tour #2, we went to Colony Grill to have a pie of pizza with my husband's friend. Between 3 of us, we shared 2 pies and shawarma that night in total. 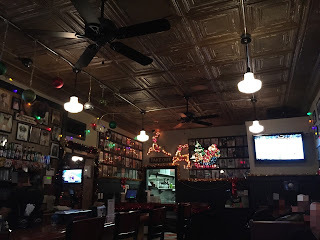 All of us have eaten Colony Grill's pizzas, but it's a must spot to visit if you're looking for a unique pizza or doing a pizza tour like we did. The cheese on the top has many little holes and it's one of the interesting aspects of their pizza I think. The dough is thin like NY style pizza but it doesn't really have crust on the edge. The bottom is lightly browned, smooth and dried. The dough is crispy at the bottom but the upper side is soft and chewy, and this chewy texture is similar to "pão de queijo," Brazilian cheese bread. Another review of Colony Grill.